Over the past five years, we’ve pointed to many examples of the Federal Reserve’s lack of knowledge as to how the U.S. economy actually works. The Fed has never accurately predicted a recession. The Fed has never seen a financial panic in advance. Fed growth forecasts are incorrect by orders of magnitude year after year. The Fed missed the chance to raise rates in 2010 and is now raising rates into weakness in 2018. The list goes on (back to 1913 in fact). Yet the Fed’s latest blunder may be the most dangerous of all. The Fed printed $3.7 trillion of new money from 2008–2014 under the banner of “quantitative easing,” or QE. There is no evidence that this ocean of new money did anything to increase growth. In fact, the 2009–2018 recovery has been the weakest recovery in U.S. history despite a few good quarters here and there. Now, the Fed is trying to “normalize” interest rates and its balance sheet with rate hikes and “quantitative tightening” (QT) by raising rates and not rolling over maturing positions in U.S. Treasuries. The first process is transparent. The Fed has raised rates from 0% to 2.25% in the past three years and is ready to raise rates again on Dec. 19. 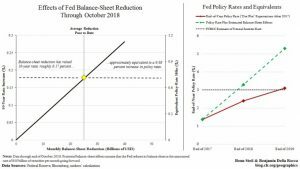 But, behind the curtain, the Fed is also reducing the base money supply with QT to get their balance sheet down from $4 trillion to $2.5 trillion by the end of 2020. As this article shows, the impact of QT is roughly equivalent to another 1% per year of rate hikes. This means that the combination of nominal rate hikes and QT is equal to 2% of rate hikes per year off an extremely low base. The Fed is tightening more than it realizes and will probably cause a recession or worse by the time it realizes its mistake. If this happens, the Fed will cut rates back to zero. But it won’t be enough. Then they’ll have to abandon QT and go back to QE4. The more things change, the more they stay the same.